The Gambia Youth Empowerment Project (YEP) delivered on 8 October agro-processing equipment to beneficiary companies valued at over 26,000,000 GMD (ca 450’000 Euros). The equipment will be handed over to 14 beneficiary groups and companies to enhance productivity and value addition, particularly at farm-gate. YEP addresses the economic root causes of irregular migration by supporting youth employment and entrepreneurship. The project is funded by the European Union (EU) Emergency Trust Fund for Africa and implemented by the International Trade Centre (ITC). The equipment includes groundnut paste making machines, ground powder making machines, groundnut roasting machines, candy rolling machines tables (candy made from groundnut and cashew), flour milling machines, rice grader and de-stoners, dehulling machines for cereals including findi, vacuum packaging machines and materials and 62 KVA back up diesel generators. “The support is part of the project’s strategy to foster private sector-led growth and job creation through value addition”, said YEP Project Manager Raimund Moser. “Micro, small and medium sized enterprises are the main project beneficiaries as they are at the forefront of creating jobs” he added. The Honourable Minister of Youth and Sports Hadrammeh Sidibeh stated that “the agricultural sector, and agro-processing in particular, offer many interesting and rewarding job opportunities for young Gambians”. Mr Luca Palazzotto, the European Union representative, highlighted the importance of rural development to provide effective alternatives to irregular migration. “The intervention provides concrete revenue-generating activities for young Gambians by engaging in product transformation and value addition at farm-gate” he said. 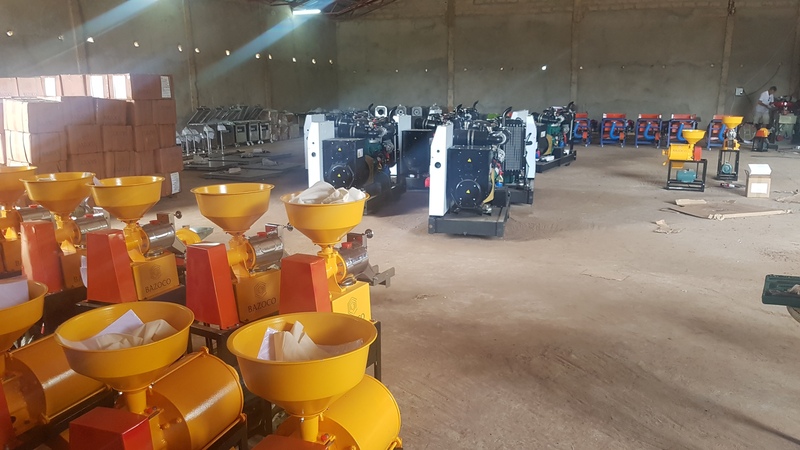 Once the equipment is installed and fully operational, the investment is projected to create over 900 jobs in total, 644 direct jobs and 300 indirect jobs for young Gambians. The 14 beneficiaries include 3 groups and associations and 11 small and medium size enterprises (SMEs) spread across Greater Banjul Area, West Coast Region, North Bank Region and Central River Region. They have all committed to support job creation within the regions where the machines will be located.